Irish president Michael D Higgins has hailed his "memorable" historic state visit to the UK as "so positive, so uplifting and so hopeful". He took to the Royal Albert Hall stage at a concert in his honour to uproarious applause and said: "On a night like this it is great to be Irish." He added it was "even better" to share it with "our friends in Britain". On the final night of his visit, President Higgins was joined in the Royal Box by his wife Sabina and Prince and Princess Michael of Kent. "In this magnificent venue and on this...historical occasion, I want to extend my thanks to a number of people who have made this evening's celebration, and indeed the past few days, extraordinary and memorable days, so positive, so uplifting and so hopeful," President Higgins said. Lord Tebbit has come under fire after suggesting he hoped Sinn Fein politician Martin McGuinness would be "shot in the back". The former Conservative chairman, who was himself injured in the 1984 Brighton hotel bombing, suggested Mr McGuinness' presence yesterday at a state banquet with the Queen might anger hardline Republicans. "There's always the possibility that a member of the Real IRA will be so outraged by Mr McGuinness bowing to the Queen that they might shoot him in the back for it. We can but hope," he said. "To publicly advocate the assassination of Deputy First Minister Martin McGuinness is a shocking throwback to a violent past from which we are seeking to move on." Irish president Michael D Higgins will meet Prime Minister David Cameron in Downing Street on day two of his state visit to Britain. Mr Higgins will also attend an event to mark the contribution of the Irish people to the NHS and meet with the Mayor of London Boris Johnson. A private but significant engagement will take place at the start of the day when the Duke of York shows the president the colours of the six disbanded Irish regiments which have been preserved in Windsor since 1922. Mr Higgins will inspect a piece of history in safekeeping for 92 years at the behest of King George V after 200,000 Irish men enlisted to fight for the Crown. Michael Higgins is the first Irish President to make a state visit to the UK, ending the day with a state banquet at Windsor Castle. 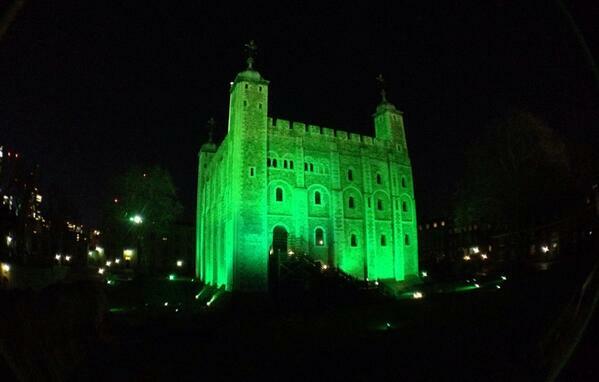 The Tower of London has been lit up green this evening as a tribute to the state visit of Ireland's President, Michael Higgins. 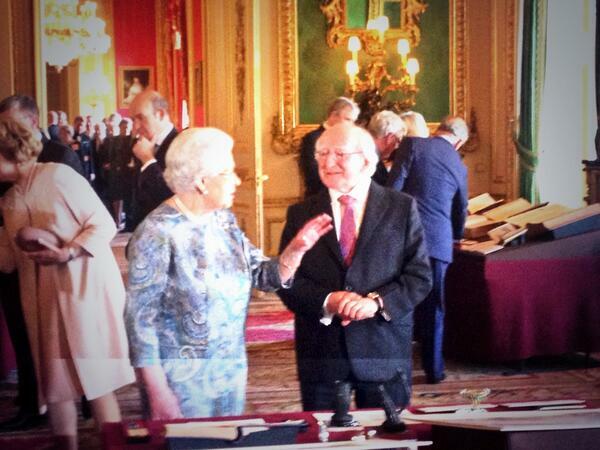 President Higgins has today met the Queen, addressed Parliament and spoken at a state banquet at Windsor Castle. The Queen has said that Britain and Ireland shall "no longer allow our past to ensnare our future" at a historic state banquet in honour of President Michael D Higgins. In her speech, in front of the political elite and stars including Daniel Day-Lewis, Dame Judi Dench and Irish rugby hero Brian O'Driscoll, the Queen said the goal of modern British-Irish relations can be "simply stated". She said: "It is that we, who inhabit these islands, should live together as neighbours and friends. Respectful of each other's nationhood, sovereignty and traditions. Relatives of people killed in IRA bombings have protested outside Windsor Castle ahead of a state banquet tonight which will be attended by Sinn Fein's Martin McGuinness. Julie Hambleton, whose 18-year-old sister Maxine died in the Birmingham pub bombings in 1974 called for Mr McGuinness to be arrested, claiming he was involved in the atrocity. Victor Barker, whose son was killed in the Omagh bombing in 1998, said he wanted people to be "reminded of McGuinness' past" as a member of the IRA. Ireland's President Michael Higgins today praised the "warm friendship" with the UK as he became the first Irish head of state to address the House of Parliament. Mr Higgins said the links between the two countries were now "strong and resolute" and there was now "mutual respect" despite historical differences. The Queen and the Irish President Micheal D Higgens have been viewing Irish items in the Royal collection in Windsor as part of the historic state visit. President Higgins will address the Houses of Parliament later this afternoon, before the royal banquet this evening. Today's historic visit is a symbolic ending to the painful separation of British and Irish states, but 3000 unsolved murders remain.